The helmet has a built in speaker and microphone which are connected to a controller mounted on the lower RH front of the smock. An external socket is provided on the controller for connection to a wireless or hardwire system. The hardwire communications system is designed specifically for EOD teams using EOD bomb disposal suits. The system provides communication between the bomb disposal operator and his back up at the base station. This is via 100m of cable mounted on a reel. 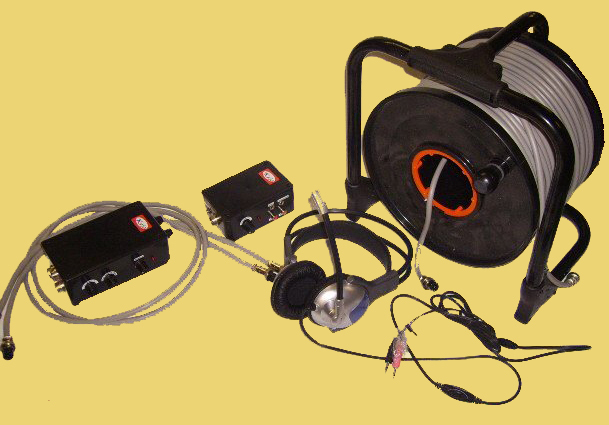 The optional Hardwire duplex communications is supplied with the base station, headset, and 100m wire on a reel. The wire plugs into the side of the controller on the front of the smock. If two way radios or other wireless communications are to be used the same socket is used to connect. However the type and make of the radio must be specified so the correct interface can be assured. The controller on the EOD suit has three controls, one for volume control of communications between the EOD technician and the base station. The second controls the ambient sound* volume and the third control button the air pump which controls the air blower. The controller is supplied as part of the EOD suit therefore all systems come with an ambient sound facility. The base station for the Duplex Hardwire system contains its own power source which is a rechargeable battery which will power the communications on the Base Station .The Suit control box has its own rechargeable battery source. *Ambient Sound Feature: An external microphone is mounted on the outside of the helmet and a speaker in the helmet on the LH side enabling the operator to hear noises in his environment. This has an automatic high decibel cut out. This facility is controlled with an ON/OFF switch and volume control accessible to the operator . Power Supply: Powered Air Purification System – Supplied with own self contained in built rechargeable battery and compact charger. Hard Wired Communications – supplied with own power supply.